In our homeschool, one of my seven-year-old daughter's favorite classes is Cooking Class. Yes, it is a big official name for an activity that most of the time is merely her helping me make dinner. But she feels important and we DO do special cooking projects as well. This collection of recipes is one of those projects. Last week, she and I sat down and made a list of what foods tend to grow in autumn (and not just where we live, which is why there is a recipe here that highlights tropical fruits and nuts!). She then matched up her favorite recipes with that food list and we chose five to share with you. If you don't have “Cooking Class” in your home (and even if you do), check out the Real Food Kids: In the Kitchen eCourse here at GNOWFGLINS. It provides some seriously good ways to teach your children basic cooking techniques, as well gives as a really solid introduction to real food. All of those techniques can be put to good use in these recipes! And one note — all the directions for these recipes are written with kids about 6 to 12 years old in mind. But I'm fully assuming an adult will be present, helping at whatever level is needed. For example, an adult is needed to put a heavy pan into a hot oven or to use a sharp knife to cut off the rind of a pineapple! This is included not because it's one of my daughter's favorite foods to eat (depends on the vegetable), but because it's one of her favorites to make and serve. There's lots of whisking and everyone gets their own little colorful serving, so it's just plain fun. We call these “Rainbow Flans” because depending on the vegetable you use, the flan can be any color of the rainbow. Choose a large baking dish with sides at least two inches high that's big enough to hold all the ramekins and set it aside. Choose eight ramekins, butter them, and set them in the baking dish. Prepare all your spices: measure out the nutmeg, salt, and pepper and place them in a small bowl. Set aside. Measure out the Parmesan cheese into a bowl and set aside. Break the eggs into a medium-sized bowl and whisk until frothy. Set aside. In a large saucepan, whisk the vegetable purée, stock, and cream until well mixed. Heat over medium heat until very hot but not boiling or bubbling. Once it's very hot, whisk in the Parmesan and spices. Place one large spoonful of the hot vegetable mixture into the egg mixture at a time and whisk very well. Continue adding and whisking until all the vegetable mixture is incorporated and the mixture is smooth. Spoon the mixture evenly into all the ramekins. Pour the boiling water into the baking pan to surround the ramekins – if the water only comes up the sides a little bit, that's alright. About half-way up is just perfect. This is called a “water bath,” or in French, a bain-marie. Place the baking dish in the preheated oven and bake until they jiggle in the middle but are quite firm, about 25 minutes. As soon as they're cool enough to handle, move the ramekins into the refrigerator to cool until fully chilled, at least two hours. To serve, run a knife around the edge of each one and place the ramekin upside down in the middle of a plate. Shake the ramekin gently to loosen and let the flan plop lightly onto the plate. Set a sprig of fresh herbs next to each flan and serve! This recipe my daughter can make almost completely by herself and sometimes she even enlists the help of her toddler brother for adding in the raisins — it's an easy recipe for any age. Makes 3 to 4 cups, depending on the size of the carrots. After washing the carrots well, grate them into a large bowl. Squeeze the lemon over the carrots. Make sure to pick out any seeds that fall in! Drizzle the honey all over the carrots. Toss everything together with a big spoon until you can see the honey and everything is well mixed. Sprinkle the raisins on top and serve. Even though these are muffins, half the time we call them “mini-cakes,” which usually means we can get away with serving them for dessert, even though they're not. They are decidedly yummy, however, so they're popular whether they're served at the beginning of the day or the end. They also require lots of measuring and dumping, so definitely good for younger cooks. Choose whether to make muffins or mini-muffins, then butter the tins or line them with muffin papers. Set aside. First, combine all the dry ingredients and either sift or whisk them together in a large bowl. The dry ingredients are the flour, baking powder, baking soda, cinnamon, and cloves. Next, peel the apple and grate it over a large plate or bowl so that you don't lose any of the juice. Pour the apple and its juice into the flour mixture and stir to coat every piece of apple evenly. Set aside. Set your eggs out (don't break them yet) and have them ready. Measure out the pumpkin purée into a medium bowl and set aside. Melt the coconut oil and set aside. Make sure it stays liquid. While the oil is melting, zest two oranges. To zest a citrus fruit means to grate just the outside of the peel very finely, so the best way to do this is to find a grater with very small holes and run the fruit over it 2-3 times in one spot just until you can see the white part underneath the peel. Turn the fruit a little bit and do it again until you've grated off the very outside of the entire fruit. And don't forget to wash the fruit very well first, since you're going to be eating the outside of it! Place all the zest in a bowl and set aside. Pour the molasses, almond extract, and sucanat into the bowl with the pumpkin purée. Whew! It's finally time to mix everything together! Break the eggs into a large bowl. Add in the pumpkin puree mixture, coconut oil, and zest. Whisk until the mixture is smooth. Pour the egg-pumpkin mixture into the dry ingredients and stir with a spoon to combine. The batter will be very stiff, but if it's too stiff to stir at all, pour in a tablespoon or so of orange juice or milk. Spoon the batter into the prepared muffin cups and bake until a skewer inserted in the middle comes out clean, about 15-18 minutes for mini-muffins and 22-26 minutes for muffins. Cool on a cooling rack and enjoy! For those of us in areas of the world that get cold in the fall and winter, eating tropical fruits during that season usually means we have to import them. However, for those in tropical climes, this fruit salad will celebrate the bounty of the season beautifully! This is very easy for kids of all ages to make, so whether your ingredients are local or imported, enjoy! Peel each fruit and cut the fruit into bite-size pieces. Place in a large bowl and cover with the yogurt. Stir to coat all the fruit evenly. Sprinkle the coconut flakes and macadamia nuts over the top and serve in small bowls. Makes one 8×8-inch square cake. Measure all dry ingredients and dump them into an ungreased 8×8 cake pan. Whisk well. Add in all the wet ingredients and mix until everything is well combined and there are no lumps. Put in the oven and bake until a skewer comes out clean, about 25-30 minutes. Cool in the pan or wait at least 10 minutes before inverting onto a cooling rack. And last but not least, an honorary mention must be made for Cranberry Coffee Cake. In our climate, we are surrounded by cranberry bogs, so this is a seasonal treat that is very local for us. This recipe swirls tart cranberries with sweet, nutty, buttery cake and is one of our favorite cranberry recipes to make together. 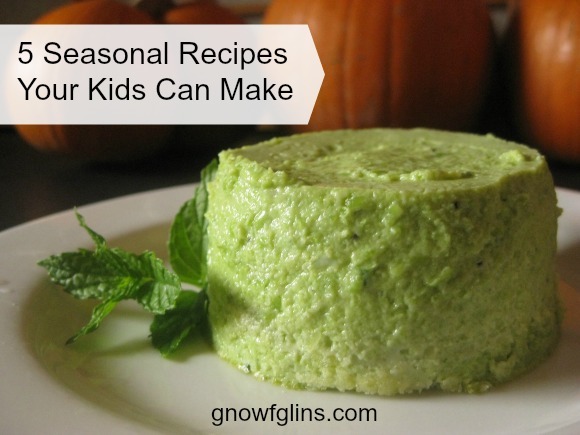 Do you have any favorite recipes for fall that you make with your kids? Please share in the comments! These are awesome recipes! THANKS! I can’t wait to try the muffin’s with my Gluten Free flour. My daughter has recently become gluten free after learning the hard way. But it is turning into a Blessing for the whole family. We are reverting back to more natural foods! I love it. New challenges just make us grow. I am really enjoying sprouting beans right now. Thanks for having a great site full of good info!!!! I love these recipes! Thanks Kresha for these creative, fun recipes. I am always looking for healthy kid-friendly recipes and it is a fact that kids like eating meals when they are involved in preparing them. So these are wonderful!